In short, yes, and Brunswick Companies can help you get bid bonds & performance bonds if you have bad credit. As a member of the Small Business Association’s Bond Guarantee Program, we are able to help small businesses enter into larger projects that require bonds when the standard market is not available due to credit issues. There are several factors to be aware of if you have bad credit, though. All underwriters will look at your credit and the credit of your spouse and/or business partners when you apply for a bid bonds & performance bonds. Each person has a stake in the company and the success of the project, therefore, their financial health is as critical to the process as yours. A bad credit report or low credit score isn’t necessarily going to result in a declination, but it will require extra work on your part to secure the bond. Large credit card debt, recent bankruptcy, or a low credit score are red flags for underwriters who will classify you as high risk. While these problems will knock you out of the standard markets, the specialty markets will often step in to issue your bid bonds & performance bonds. What helps reassure the specialty market underwriters is seeing on-time payments to those credit cards and an active effort to improve your credit rating. For example, someone who has a low credit score and is paying off debt regularly and on-time will be more likely to secure a bond than someone with a low credit score who has missed several payments altogether. You may have guessed that specialty market underwriters will require a higher rate for hard-to-place bonds, but some may also require collateral in order to issue bid bonds and performance bonds. This collateral is most often cash or a letter of credit from an approved bank. Having collateral helps the underwriter ensure reimbursement against a surety loss. Therefore, the collateral will be held until roughly 90 days after the obligee deems the project as being completed satisfactorily. Do you know what your credit report looks like? If not, now is the time to check. By being aware of your credit standing now, you can be more prepared for the requirements once you apply for a surety bond. Visit the Consumer Financial Protection Bureau for all the available options to request your free annual credit report from Experian, Equifax, and TransUnion. The CFPB will direct you to the only website authorized by law to provide you with your credit report for free. The accuracy of your credit report is extremely important because it is used to determine your credit score. 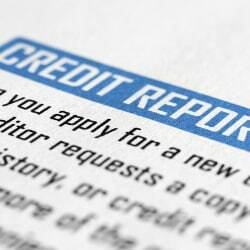 You should check your credit report for errors and, if you find any, report them immediately. Each reporting agency will have way to help you correct errors. And though your credit score is not included in the free reports, you can obtain it for a fee and be aware of your standing. Now that you are prepared to obtain a bid bond or performance bond with less than perfect credit, call Brunswick Companies at 800-686-8080 and talk to Jeff McQuate, CPCU AFSB, in our Surety Department. Be sure to mention that you would like to be considered for the SBA Bond Guarantee Program.